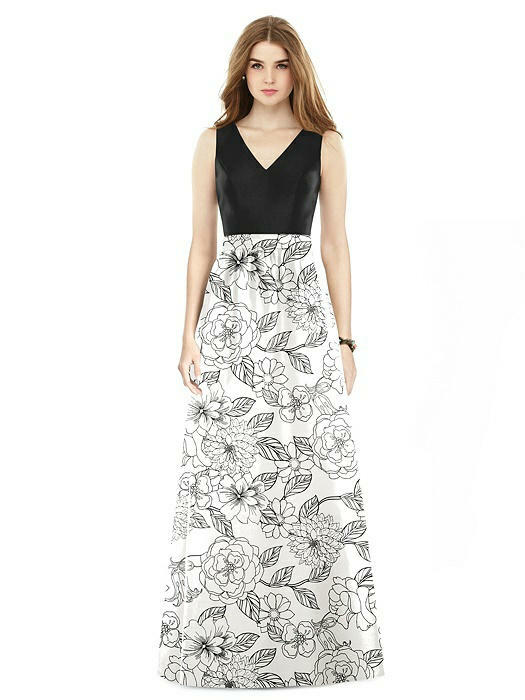 This elegant full-length sleeveless dress offers options for combining colors and prints on its seamed bodice and full skirt. Be creative in assembling a lovely gown with a hint of casual flair, made from sateen twill and offering side pockets on its slit skirt. This style is available in a blush bodice with blush bouquet skirt, white bodice with white bouquet skirt, black bodice with botanica print skirt, and black bodice with polka dot print skirt. Fit Tip: The natural waist and bust measurement take priority for style D752CP. If you are over by an inch or two on the hip it is not a problem. There is plenty of extra room in the skirt to accommodate. If you would like help choosing your size, please contact a Dessy stylist.